The Michael Kors Access Sofie is a stunner of a smartwatch, combining beauty with brains, especially when paired with an Android device. It offers a solid, luxurious and waterproof design, enough bling to make it stand out from the rest of the Android Wear crowd, while also offering a decent performance and a good battery life. Fashion brand Michael Kors is back with a second version of its Access smartwatch - the Sofie. The device follows on from the chunky but brilliant Access Bradshaw and it brings a smaller design, some serious sparkle and a fully round display. Yep, that's right, no "flat tyre" at the bottom of the screen like the Bradshaw. Does the Access Sofie have brains as well as beauty? We've been blinding people with the bling from this smartwatch for the last month to find out. The Michael Kors Access Sofie is a Kors watch through and through. For the fans of the fashion giant, the Sofie won't disappoint. It is everything you'd expect and more, including waterproofing (that's the IP67 rating bit). The Access Sofie brings style and substance in a premium and solid build quality. It has a 42mm stainless steel casing, smaller than the Access Bradshaw, and its display is surrounded with crystals, ensuring this Android Wear device does everything but go unnoticed. For some, it will be too much and perhaps still too chunky (despite it being smaller than its predecessor), but we love how versatile the Sofie is. It complements everyday clothing as well as smarter clothing, suiting all occasions perfectly, even black tie. It's comfortable to wear too. To the right of the watch is an MK-etched button which powers on the display, brings you to the main Android Wear app menu and launches Google Assistant - more on that later. It doesn't twist like the LG Watch Style's button, so you'll need to use your finger to scroll through your options on screen, but it is clean and simple. The back of the watch face is plastic to allow for wireless charging via a handy disc, but this is the only element of this watch where you'll find a slightly cheap look. The rest of the device screams premium with a nice weight to it, just as you would expect from a Kors device. The Access Sofie features interchangeable straps, with the metal-linked bracelet style that comes with the device slightly narrower than the lugs, which we love the look of when on the wrist. To change the strap, it's simply a case of pushing the buttons either side of the lugs to release, while putting them back on is a little more fiddly but certainly not difficult. The strap is fastened with a butterfly clasp so it's nice and secure. As the Access Sofie is a smartwatch, the traditional Kors face is replaced with an AMOLED touchscreen display. Everything displayed on the screen is clear and crisp, which is what really matters. Unlike the Access Bradshaw, the Sofie has no "flat tyre" at the bottom, too, offering a fully round face. We thought the Bradshaw did a fairly good job of hiding the sensor that causes the flat tyre look, but having a fully round screen is certainly preferable. Colours are vibrant and punchy, as you expect from an AMOLED display, and the screen is typically responsive. It's a beautiful display that handles bright, sunny conditions well, with the display automatically adjusting accordingly to ambient light. However, there were a couple of occasions during testing when the responsiveness wasn't perfect or as quick as we would have liked, mainly when saving a watch face to MK Access My Looks - more on that in a minute - but these were rare instances, so nothing to be too concerned about. We would also prefer notifications to appear with a black background rather than the slightly washed-out grey. The display offers enough vibrancy even when not on the highest brightness setting, which is great for saving battery life. There is also the option of an Always On display, something the likes of the Apple Watch doesn't offer. The Always On face is darker and more subtle, switching to monochrome and showing just the time to preserve battery life. The designs and layouts of the Always On display vary depending on the interactive MK watch face chosen - but they all make the Access look like more of a standard watch than a smart one. We really like them for that. Those interactive MK watch faces are one of the best things about Michael Kors Access smartwatches too. It's one thing to have a smartwatch mimic the design of traditional watches by the same company, but having the signature, customisable faces takes things to the next level. The Michael Kors watch faces make the Access Sofie look like a Michael Kors watch, while the premium materials make it feel like one. Together they offer the complete package to Kors fans. There are numerous Michael Kors watch faces to choose from, all of which can be customised and all of which lovers of the Kors brand will likely recognise from the huge portfolio of traditional watches offered by the company. Customising watch faces is a standard feature of Android Wear, but the MK faces are specific to the Access watches and, as with the Bradshaw, everything from the dial colour to the crystal colour can be changed to suit whatever outfit or mood you want. Once a look has been created, you can save it to the My Looks section of the MK Access app, where everything is organised by dial colour, allowing you to find it easily for the next time you wear that purple leopard print dress. Yes, we did do that. It is also possible to set the Access to automatically change between day and night faces via the MK Access app. Choose a day face to run between 6am and 6am and a night face to run from 6pm to 6am and the watch will change accordingly. It's a nice touch and one that comes in handy, though it would be even better if you could customise the times. In addition to the MK watch faces, it is also possible to use an image from social media as your watch face, whether this be your favourite Instagram post or your Facebook profile picture. Yes that's right, you can have a picture of your beautiful face on the watch face if you really want to. We didn't like our face enough but we did use an image of a New York sunset that we'd taken instead. The Michael Kors Access Sofie runs on the Android Wear 2.0 platform. It's compatible with both iOS and Android devices, though you will get a more seamless experience when using it with an Android device. It works well enough with iPhone, though, you just don't get access to the watch's full potential. As with other Android Wear smartwatches, the Access Sofie delivers notifications to your wrist from emails and text messages, to WhatsApp notifications to incoming calls. Pretty much any notifications you have coming through to your phone will appear on the watch, along with the equivalent level of detail. For example, if you have WhatsApp preview turned off but notifications on, you'll get a notification of a WhatsApp message on your wrist, but you'll need to pick up your phone to see what the message says. When a notification appears, a light vibration and sound will notify you to an alert, if you have the latter turned on. A card will then appear on the watch display, which you can tap on to reveal more information and swipe left-to-right to dismiss. You won't be able to reply or anything when the Access Sofie is paired with an iPhone, though, so bear that in mind. Pushing-and-holding the Sofie's button will launch Google Assistant, which you can then use to ask Google for various information, such as what the weather is like, when your next meeting is, make a call or set an alarm. It works much the same as any other Android Wear device with Google Assistant. The Assistant experience is better on Android. iPhone users won't be able to make use of the calling functionality through Google Assistant. The Access Sofie also offers multiple time zones, which you can add as a complication on some of the watch faces, as well as automatic updating of a time zone and basic activity-tracking through Google Fit. Unlike some Android Wear devices, like the Huawei Watch 2 Sport, the Access Sofie doesn't have any additional sports features like GPS or a heart-rate monitor. We really don't think it matters with this device, however, as the crystals in the design make it a less than ideal choice for the gym or a run. The Michael Kors Access Sofie has to be paired with the Android Wear app on your smartphone in order for it to work. iPhone users will need to ensure this app is always running in the background - close it down and the Sofie will disconnect from your phone and you won't get any notifications coming through to your wrist. The app features a Michael Kors skin but the experience is no different to what you would get with any other Android Wear device. It's pretty basic, especially on iOS, with many of the features offered within the app also available on the watch itself, such as selecting and customising a dedicated Michael Kors face. You can access information about your account, your feed, Google Assistant and block specific apps within the Android Wear app by tapping on the settings cog in the top right corner - but you'll find everything from system apps, display and gesture controls and notification settings on the watch itself via a swipe down on the main watch face. The Michael Kors Access Sofie's battery performance depends on several factors, including display brightness, what kind of device you have paired to it, and the number of notifications you have coming through. We used the Sofie predominately with an iPhone and we had all our WhatsApp notifications, calls, texts and social media alerts coming through, though not emails. Occasionally we had the display brightness turned up to full, but most of the time we had it on around 50 per cent and we were often left with around 20-30 per cent battery by the end of our evening. There were occasions whereby the Sofie only just made it home after a long day and night before it ran out of juice and there were times when the battery saver mode kicked in before we would have liked it to. Overall, however, the performance is no less than you get from most smartwatches, if not better, with around a 15-16 hour battery life. It's not the 24-hours claimed by Kors but as it'll be plugged in every night this isn't a deal-breaker. In terms of overall connectivity performance, the Access Sofie was consistent throughout our testing. It rarely dropped out and when it did, that was normally because we had accidentally closed down the Android Wear app on our smartphone. Some notification logos didn't always appear, such as BBC News, but aside from that, the Sofie offers a smooth performance. The Michael Kors Access Sofie is a stunner of a smartwatch, combining beauty with brains, especially when paired with an Android rather than iOS device. It offers a luxurious and waterproof design, enough bling to make it stand out from the rest of the Android Wear crowd, while also offering a decent performance and a good battery life. And this time around it comes with a fully round watch face, which elevates it above and beyond its Bradshaw cousin. 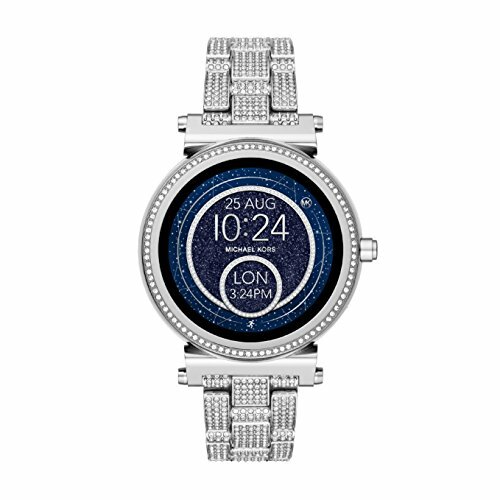 The customisable Michael Kors watch faces once again make this smartwatch feel that little bit more special than its competitors, while the customisation options and the way "Looks" are organised is excellent, especially for those who like to match their watch to their outfit. For the MK fans who love the signature, chunky and blingy watches from the company but want them connected, the Sofie won't disappoint. It is fashionable, functional and not a smartwatch we have any intention of taking off anytime soon. The LG Watch Style is a simple but effective smartwatch with good overall performance and a great software experience. It doesn't offer the same premium appeal as others in its field and it lacks thrills in terms of features, while not being the most stylish smartwatch out there either. What the Watch Style does offer however, is simplicity which, for some, will make it a perfect first smartwatch. If you're after a smartwatch that looks like a premium, fashionable watch, then the Watch Style isn't the device for you. But if you want a smartwatch that's comfortable to wear and easy to use, then this LG offering does Android Wear 2.0 justice. The Michael Kors Access Bradshaw has a beautifully solid build quality that is not only comfortable, but looks great too. It has inherited that "flat tyre" black bar to the base of the watch face, which means the screen isn't fully circular like the Sofie but it covers it up better than others. The dedicated MK faces make an appearance on this Access smartwatch too, with great customisation options and excellent organisation of "Looks" once again. The Access Bradshaw is chunkier than the Sofie, which some MK fans might prefer and it is also cheaper now too.